The first step in vertebrate vision is a biochemical cascade of reactions initiated by the absorption of a photon by the visual pigment (opsin) and leading to closure of cGMP-gated ion channels that hyperpolarize the photoreceptor cell and generate a nerve impulse. 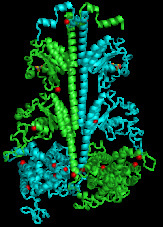 The photoreceptor phosphodiesterase (PDE6) is subject to precise regulation of its activation (during visual excitation), inactivation (during recovery), and desensitization (during light adaptation) to control cGMP levels in the photoreceptor at each stage of the visual signaling process. Defects in PDE6 cause retinal disease but the molecular basis is not understood.